First of all, I and most of the friends that I hang out with are not bar hoppers at all. For us, a night out is more like movie followed by drinks in a hotel lounge or maybe even a few hours in a Starbucks. Pretty lame, right? Well a few weeks ago I was called to Clark for a meeting, more like a job interview really. It was a Saturday and I really didn’t feel like taking the bus so I rounded up a few friends who are due for an out-of-town trip. Together we drove up to Clark Pampanga, sharing gas expenses and toll fees. After the meeting, we went looking for places to hang out. Our first thought was to find a good bar in Clark or a nice pub with happy hours. Driving around Clark was very pleasant except for two times when we got stopped by the traffic cops. Twice we got off with warnings. Boy, the cops in Clark Pampanga are really strict. But the funny thing is that there are so few cars on those wide roads too. What a waste of public money. Manila should borrow some of these policemen and make the traffic better for us. Anyway, I am not here to talk about traffic and cops. After about an hour of cruising around, we spotted an unusual house. It was inside Mimosa. The sign outside read “The London Pub” I was in the mood for some grub, so we went in. It was about 4 to 4:30pm and the place was dark and quiet. There was one waitress inside and she looked like we just woke her up from her siesta. We decided against ordering the usual poison – San Miguel Lite – and opted for something classier. We ordered a bottle white wine from this pub. The waitress suggested a nice French white wine, called Macon Village. They also came in smaller bottles, like half sizes, so we said, what the heck? we can easily finished that, right? We were right. The stuff was good and we ordered a regular bottle within like 20 minutes. By 5:30pm, customers started to trickle in. Some played pool. I learnt how to throw darts from a foreigner who offered to teach us. I got pretty good at it after an hour. I can hit the board one out of three throws! 3. The food and wine are excellent. We left at around 9pm. By then the place was filling up with customers. But it is the kind of crowd that is not rowdy and loud. I got the feeling that this bar in Clark is one of the most upscale establishments in the community. My job interview went not so well, so it doesn’t look like I am relocating to Pampanga anytime soon. But I think Clark has somehow found its way into my arteries. I don’t know why but I am sure I will be back sooner than I think. If I do, I will spend more time in this bar in Clark. 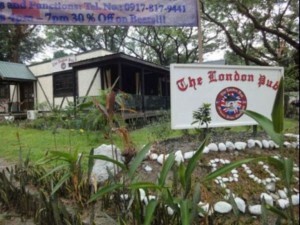 I recommend the London Pub as a good resto bar in Clark Pampanga. 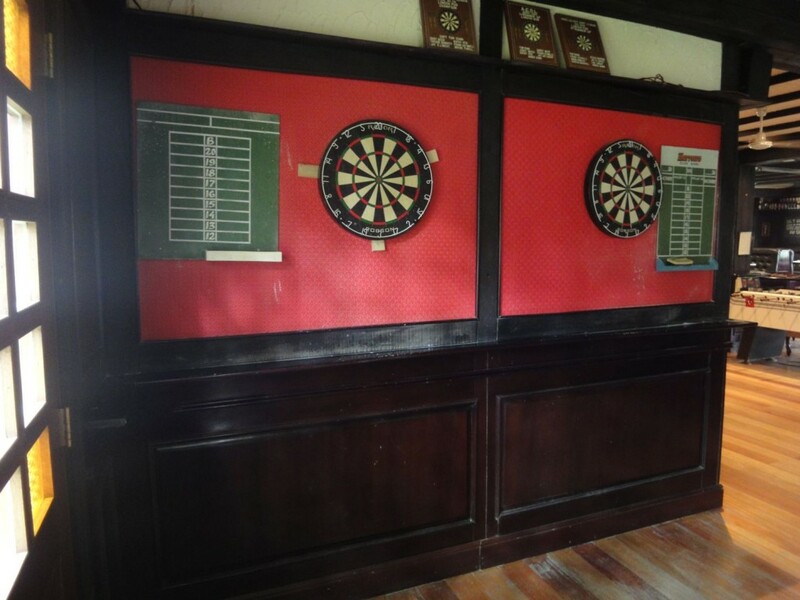 This is a bar in Clark that you can go alone, with friends and even bring family with kids. The food is really good. The fish n chips is the best I have had. Prices are much lower than those in the bars in Manila. I didn’t feel ripped off. The editor of HotelClarkPhilippines.com expresses appreciation to Janet for sharing with all of us her experience in a good bar and pub in Clark Pampanga. 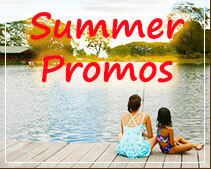 It is through the eyes and feelings of fellow travelers and frequent visitors to Clark Philippines that other travelers, especially first-time visitors to Pampanga Clark Freeport Zone can better plan their trips and make informed choices of where to stay, visit and dine out while staying in Clark. Thank you Janet for telling us about a good bar in Clark Pampanga.